Atsuro Yoshida racing on Sakura. Twenty-six horses from all over Okinawa including neighboring islands performed at the event, entertaining the audiences with its rare running techniques and beautiful decorations. It featured the first participation from outside of Okinawa since the event was brought back in 2013. After the competition, the judges awarded Nanami from the Okinawa Zoo & Museum the championship. N’maharashi, which began the Ryukyu Kingdom era and continued to 1943, is known for its racing in which horses compete with uniquely-paced running techniques. It is different from common horse racing in which horses and riders compete for speed. Instead, the competition is decided based on the form and decorations of the horses while running. 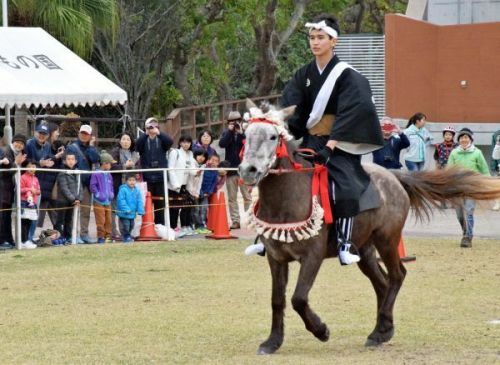 There was a five year-old female horse that was born in Ibaraki and raised in Miyagi that for the first time joined the competition from outside Okinawa. The horse, named Sakura, is a Hokkaido-bred horse known as “Dosanko,” one of the native horses of Japan. Sakura was born with an attractive running technique that caught people’s attention. Sakura competed against Isu from Kume Island in the first match. She performed perfect pace and beautiful running posture, yet the judges decided the horse fell just short of winning the race. Sakura’s rider, Atsuro Yoshida, 17, came from Chiba Prefecture to attend this competition and trained for the match. He has known Sakura since they were little, saying that “The horse has very calm personality and she never bites.